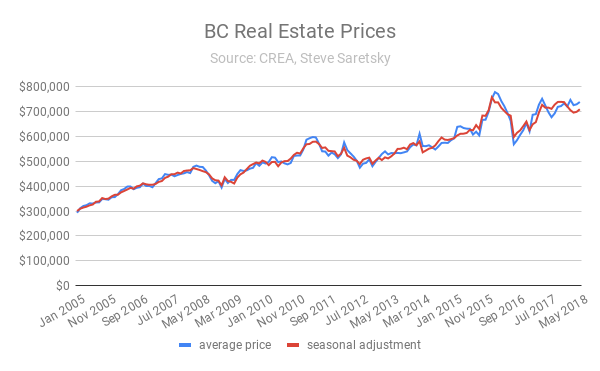 With National home sales declining by 16% year over year in the month of May, marking the worst year over year decline since May of 2008, we turn our attention to the province of BC where home price growth has grossly outpaced any other province in recent years. On the surface the BC economy appears to be humming along, unemployment rates remain low, declining from 5% in April to 4.8% in May, with a plunge in the Vancouver metro area from 4.5% to 3.8%. Labour force participation rates and employment rates remain elevated which is helping pump Year-over-year growth in average hourly wages from 5.6% in April to a whopping 6.9% in May. However, a recent slowdown in the housing market is beginning to test the province of BC. Fewer full-time positions drove a 0.5%, or 12,000-person dip in total employment from April. Overall, employment has eroded since a December peak, cutting year-over-year growth to 0.1% which was the weakest since 2015. This might not be surprising considering recent data on the housing front. BC home sales dropped by a head turning 29% year over year in May. This marked the largest percentage decline on a year over year basis since May 2008 when home sales tumbled by 31%. 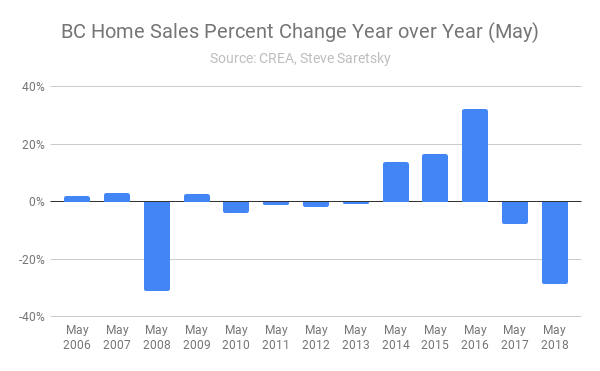 Home Sales percentage change year over year. While falling sales might not be nearly as concerning to the typical homeowner as sale prices, it is important to see the clear directional shift in the real estate cycle. Sales have moved lower for two consecutive years, pushing inventory higher. Active inventory increased by 19% for the month of May. 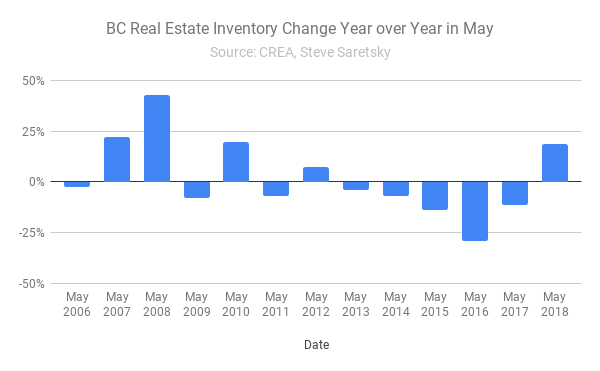 This was the first time inventory has increased on a year over year basis for the month of May since all the way back in May of 2012. Percentage change in Inventory levels year over year. Two years of declining sales combined with an increase in inventory has arrested house price inflation. The average sales price dipped 2% year over year, while seasonally adjust prices dipped by 2.5%. As you can see in the chart below, home prices peaked in the spring of 2016, followed by a dip after the announcement of a foreign buyers tax, before retesting those peaks in the spring of 2017. Since then, growth has been effectively flat. With the BC economy so dependant on the real estate sector the direction of the housing market will become critically important in the months ahead.